@Sardar: Glad you found it useful! If you come up with good ideas/feedback or requests for new posts, feel free to share them here! Very useful! I’ve only ever really got on with iCal but this seems like a great approach. Thanks for sharing. 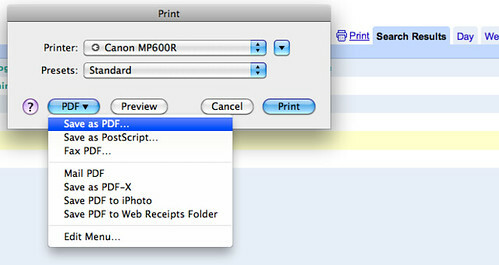 Especially liking the export to PDF function. Very useful post Andrea. Love it! I had never thought of using Google Calendars this way before. This is definitely one to use with Drew for the next AoC! This is a nice guide, but why would anyone want to do this? When I read this article, I remembered all these articles about how projects can be run using Google wave, yet at this very moment I don’t know anyone (and I run a very known project management website) actually using Google wave for project management. There are so many tools out there dedicated for Project Managers, why would they want to “make” one of the tools act as a Project Management tool? I guess people want to do this because it’s handy and it plugs into what people are already using (their google accounts, etc.). The point is that they don’t have to “make” this one of their tools or have an additional tool. It’s more about optimizing what they already have. About Google Wave, it’s too early to say. I think we’ll have to let then get out of beta to be able to use it actually in a more productive way. I tried to used many project management tools with my team but in the end those where just additional places to go and additional accounts to check/stay tuned on. Working in this way, as I explained in this post, everything is connected without creating any extra place to be of think of. Ironically, we built our product, ProjectGoo, using this exact premise (tasks-Google Calendar) … I designed this for my business management and we’re an under 50 person development shop. Free for your entire team and it uses the Google Cloud so your data is accessible across the planet. We use this to work with our developers in Uruguay, India, and Russia plus our onshore people. I’m happy to give you a WebEx walkthru and help you get up and going. Obviously, we’re not making a mint … but we do love showing off the tool 🙂 Regardless, good luck with the great idea above! Thanks for sharing! Is there is a way to produce remainders sent to different members of team of one particular project? Thanks for all the tips! I just started using Google and I’m trying to use it as a project manager. I am unclear about how to apply repetitive task lists to individual calendars and then be able to see them all together in the main calendar. Is this possible? Thanks for your help! Hmmm. Not sure about that (I don’t use much ‘tasks’) but I think you can get there or to something similar by creating an entry that is repeated every ‘tot’ days, weeks, years… Hope that helps! Is there any way to get visual information that would look like Gantt view of the project? @Simon Not that I know. One way to get something closer/similar is to visualize a certain project (searching for a #tag) in the “Agenda” mode. I hope that helps! Can you expand on how you place tasks and create a timeline for a project? Hi. Nice post. Sorry I’m late to the party, but I’m just implementing a version of this in order to track projects in my (new) freelance business. I’m curious about the hashtags. Why are they necessary? I see that they function as unique markers, but if you’re giving each project a unique identifying word or string of some sort anyway, does including the actual hash mark make much difference? I’m sure it does somehow, and I want to understand. With the announcement last year of wave enhancements being stopped have you moved to another collaborative tool? Great posting! I am with a small company and we are struggling to find a good project management fit. We really want to gear the project management for the clients, so these programs that want to include all the financial aspects, risks, and requirement of updating all the time (or things go into incomplete!) are out of the question for our clients to see. However, I was wondering if you had any advice for making the calendars looking more professional. I have founnd that if you have more than a couple things on a day that rows will end up being different sizes (which I think doesn’t look great). Also, do you find that many people will create google accounts to be able check the updated calander? Just wanted to say thanks for this — I came across it when searching for a project management app that would integrate with Google Calendar because it had never occurred to me to use GC in this way. 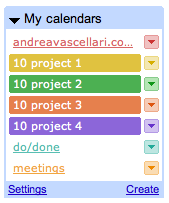 Since all I’m looking for is an easy way to manage and schedule a bunch of different projects, this is perfect! @Jennifer Sure. You can customize the calendar with your company’s logo etc. only if you are using Google Apps http://www.google.com/apps/intl/en/business/index.html Calendars created with gmail accounts don’t have the same level of customization. I hope this helps! I am having a lot of trouble figuring out how to customize my calendar on google for work – I log in to the google for work and go to the calendar but do not see any options for customizing the calendar (I am using the free trial and I am worried that maybe I am just completely missing this option). I dont know if I am completely missing something but I was wondering if you could tell me how you go about uploading logos/changing colors on calendar, etc. I would really appreciate the help! Thank you. @Jennifer If you are a Google App user then you can easily replace the Google Logo with your own logo by going to Manage Domain/Domain Settings/Appearances – and select the Custom Logo Option and your Groups Logo will appear on all Google App Pages. 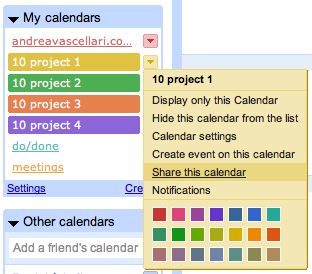 To change the calendar’s color click on the little ‘arrow button’ that you find next to the calendars listed on the sidebar of your Google Calendar’s page and then choose one of the displayed colors. I want to work more effectively so I searched about the functionality of Google Calendar online. I clicked your link first and already learned a lot. Thank you for your generous sharing. I’ll start trying. Are you still using Calendar for your project management? I have been trying many many applications ( there is a lot on the market !!) to find the right project management tool and the more I try new apps the more I think the answer is right in front of me with Google Calendar. Love the simplicity and versatility of this option.I will experiment for a few weeks and send you some feedback. Thanks Andrew! Yes I still use it every day 🙂 I hope you found this post helpful. I like this. Simple and powerful use of sth right in front of you. A big disadvantage I see is to account for entries/tasks that are in the past, e.g. when you forget one, can you be reminded until you “mark” it complete? Do you have any idea on that? @jessor Yep, if you didn’t make it you can easily move the task to another day. You can keep postdating until you get it done. maybe…set it to recurring until you finish? Sure that’s another option. If you have just a few entries, ‘recurring events’ might work well too. However, if you have a lot of recurring entries your calendar will end up being too “busy” and difficult to manage. – When your managing projects with a lot of tasks, and probably multiple team members, you might want to move entries from one day to the other. – For simpler tasks that just require a few steps, ‘recurring entries’ will work just fine. I love the post. I have been looking for a solution to manage multiple projects with separate timelines. I am in sales and have set up a callback calendar as well as a ‘project’ calendar for each pending transaction with delivery timelines built in. Such a great idea and it was in front of me all the time. Nice post! I’ve come across this post more than a year after it was published, however find it very useful! The one option I would like is the addition of the notes/description for each item within the respective calendar. Overall though, it’s a great solution! Ah, found it! Now it’s the perfect solution! I was about to tell you how to do it but I guess you just figured it out 😉 Glad you found it useful! I’d like to schedule a church service with 5+ people that have different task roles in the same time block. How can I assign them to the calendar in the same time block with an indication of their role, e.g. John Doe-usher, Jane Doe-pianist, Mary Doe-reader and send them email reminders? 1) Via email: Once you have created the entry you can click on it and select “Edit event”. From there you will be able to click on “Add guests” and add the email address of who you want to notify about the entry (you can add multiple emails but make sure you’ve first shared the calendar with them). Once you’ve done that you will be able to send them emails about the entry, the handy thing is that the “event information” will be included in your message (indeed just if you want/need it). So you can think of this as some sort of invite to the event you created. I usually send the email/s right after I created the entry so the people receive immediately the info about the entry and save it on their agenda (in case they are not using/familiar with Google Calendar). 2) Via automatic email: This is a bit more complicated but there’s a way to make it work. To do this you first have to sync your Google Calendar with iCal (Mac). I explained how to do this here http://www.andreavascellari.com/?p=3702 (in this post I talk also about syncing the iphone, no worries about that, just focus on Google Calendar & iCal if that’s the only thing you need). Once you synced the two, you’ll be able to setup email notifications to different addresses directly from iCal. Here’s the tricky part. You can only setup email notifications to email address that you have saved in your personal address card in the Address Book (on your Mac) – if you didn’t save your personal address card (about you) in your Address Book, this is the time to do it! 2.a) You add the email addresses of your team to your address card in the Address Book. The downside here is that when you share/use you address card for other reasons you’ll end up sharing their addresses too. 2.b) You add to your address card in the Address Book a specific email address that you created for calendar/agenda notifications. It could be something like “only-calendar-no-reply@YourOrganization.com” (got the idea?) basically something that doesn’t look weird when you’ll share your address card with someone else. Then you can setup that email address to forward incoming emails to your team email addresses. At this point when you want to create new entries for your team you’ll just have to setup an (or multiple) email notifications to that specific address ( “only-calendar-no-reply@YourOrganization.com” ). This way every time an email notification is sent out, your team members will receive it automatically in their inbox. Hi Andrea, Thanks for your excellent post, i have been so far using other PM tools, i know google calendar, but now only i realized why can’t i use as my PM tool. this article is excellent. could you please able to make it video explanation and share any links. “just with a sample project starting to how to proceed and share etc. Nice job, Thanks a lot. I’m glad you found it interesting. Video? That’s a good idea, I think this is something I can add to the “to-do list”. I will share more info about it in my newsletter. Stay tuned! This is so helpful! I’m working with a small company that’s being overwhelmed with projects and in order to grow, we need an organized view of our projects. And preferably, we would need to add files for each person on the project to access. As far as I know, you can add files to events. Hopefully there won’t be any limitations! I’m happy that you liked it and I hope it will help you, and your team, in future projects! We are using a google sites for meeting minutes. We use a seperate page for each meeting: 1- We write the agenda before meeting. 2- Note assigned tasks during meeting. Now we want to use google calendar for writing tasks, but we also want the sites page have a list of, or a link to, the tasks assigned in that meeting. Obviously we don’t want to write same stuff twice. Is this possible somehow? Yes it can be done. There are two ways to do it. 1) You have to use the Google Calendar API v3. In this case you have to do this for every task. 2) Another, and easier, way to do this is to include in Google Sites a direct link to the calendar page. For example you could include the link at the end of the list of tasks that you wrote in Google Sites, so when you or someone else needs to check the tasks, it can be done with a simple click. clicking on Calendar settings >> (you get on the Calendar Details page) click on the HTML blue button next to the “Calendar address” >> you’ll get an address to access your calendar in any web browser. This is the link you have to include in your Google Sites. Thank you for the post, great blog. My projects all run to very similar timelines from 1 task to another. I am looking for a way of creating a template time of events and then importing to a calendar to sync with my iPhone/ipad etc. and then adjust the timeline accordingly. Do you know of anything that can do this? In Google Calendar the timeline can’t update automatically so if you finish a task before the deadline you’ll have to manually re-arrange the others. You can setup automatic notification (via email, too) for each task one/two days before so you will remember to have a look at upcoming tasks and eventually organize them on your timeline like you want. In general, I would suggest you to have a look at the timeline every day when you finish to work, it will help you to keep your timeline and schedule well organized. I will look into the notification option this sounds like a great tool.